There were nine major planets in the Solar System and it was within their boundaries that man first set up interplanetary commerce and began trading with the ancient Martian civilization. And then they discovered a tenth planet—a maverick! This tenth world, if it had an orbit, had a strange one, for it was heading inwards from interstellar space, heading close to the Earth-Mars spaceways, upsetting astronautic calculations and raising turmoil on the two inhabited worlds. But even so none suspected then just how much trouble this new world would make. 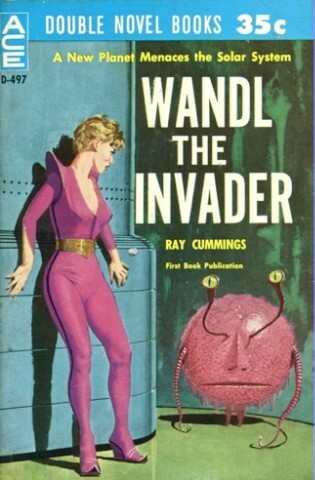 For it was WANDL THE INVADER and it was no barren planetoid. It was a manned world, manned by minds and monsters and traveling into our system with a purpose beyond that of astronomical accident! It’s a terrific novel from the classic days of great science-fiction adventure—now first published in book form. First off, big thanks to the University of Missouri library in Rolla Rolla for sending me this so I could read it. and some subsequent discussion of just how good that alien design was that got me thinking I might as well track down the original book and give it a read. Praising the cover is the best thing I can do with this book now I’ve read it. It’s Ed Valigursky, according to the ISFDB. This isn’t the first time something like this has happened, but this is the most disappointed I’ve been about it: This book turned out to be the sequel to a book I didn’t like. And it’s not that the previous book was one I hated. It might have been entertaining to have a followup to something like that. No, the previous book in this series was boring and dull and regular old historytimes-sexist. So I googled it and found my own blog. I re-read the review and even now I have no memory of writing it. I rarely drink and I don’t do drugs (more power to you if that’s your choice and you behave responsibly, though) so I think the only excuse I have for forgetting is that the book wasn’t memorable. The sequel…is much the same. I’m struggling to remember a lot of what happened. I took at least three naps while reading it. Still, it was better than Brigands of the Moon. The plot is a little better. While the first book was pirates trying to steal stuff on the moon while I yawned along, this book had alien invaders coming into the Solar System for mysterious reasons. Those reasons turned out to be both kind of clever and absolutely bananas, so credit where it’s due. At first nobody even knows there are aliens. We learn as the book begins that there is a body entering the Solar System from interstellar space and that it behaves in some peculiar ways. This gets the attention of Gregg Haljan, the hero of the last book and one of the most useless protagonists the pulps ever gave us. It’s refreshing, in a way. Whereas most pulp protags are so powerful and smart and charismatic that nothing could ever threaten to harm them, Gregg is a complete failure at everything. And it’s not that this is the story of a guy who is a failure. This isn’t satire. He’s written straight and I think we’re supposed to think he’s a special hero like all the rest, even though none of his actions bear this out. At a certain point I’ll get to, I think Ray Cummings even realized it and cranked it on up so we can all hear it. But before that, we get re-introduced to him and his pals. There’s Anita, Gregg’s girlfriend or fiancée or one of those things. Maybe the best word is “love interest.” Anyway, there are also Snap, an engineer, and his love interest, Venza, who is from Venus. The jacket copy for this book—which wasn’t technically jacket copy because Ace Doubles don’t have back covers—really plays up how important the story is to Earth and Mars. Never once mentions Venus even though one of the main characters is from there and it’s just as advanced and important and threatened as the other two planets. There are about two pages of “I bet this new planet is more than it seems” before Gregg and crew get a call from some military official that’s all THIS NEW PLANET IS MORE THAN IT SEEMS so Gregg and crew hop to action to do whatever they need to do to help. It turns out that Gregg is called on to do…not much. Which is fine because that’s all he ever does. The real heroes of this book are the women. I’m not sure how intentional this is. Yes, they do most, if not all, of the dangerous work. But the previous book had some atrocious views on women, having no problem at all describing them as property and useful as baby factories. Besides that, this book doesn’t follow the women as they do all the important work. It follows Gregg and Snap, who sit around and worry until they spring to action, wreck the whole mission, and rescue the women even though they’ve given no indication that they need rescuing. The women’s mission is to pump this Martian guy, Molo, for information. Some spy stuff at the beginning of this book shows that Molo and his sister Meka are in contact with the aliens that have freshly arrived in the Solar System. The mission was supposed to be Venza’s alone because of her Venusian wiles, but Anita comes along to protect her. Gregg and Snap also jump up to protect “their women” but are shot down. I’m struggling to remember what order this plot takes place in. The pacing was so wacky. The book would go for several pages of people talking about whatever and then four things would happen. This novel was originally serialized, and I get the feeling that this is an artifact of that medium. There’s a fair chance that if I read this book in the chunks it was written to be read in, I wouldn’t feel so weird about it. Gregg and Snap track down the women and the Martians but it turns out to be too late. A thing happens. The Martians have put down some kind of device. Gregg and Snap are unable to stop them from starting it, surprise surprise, and…somehow…for some reason…the women and the Martians and Snap all disappear. I think that might be because the thing that happens is very bright and the Martians whisked them all away? Let’s run with that. The thing is a gigantic solid impenetrable ray of light that reaches up into the sky and apparently extends to an infinite length. At the same time that it goes up on Earth, identical ones shoot out from Mars and Venus. Now here’s where I was pleasantly surprised: My assumption was that these three beams were supposed to intersect and then something would happen. Probably a demon was summoned or somesuch. I was thinking of what a silly idea this was because the planets are not only moving in their orbits, they’re also spinning on their axes, so lining these things up would be a real feat of math and coincidence. We learn later that these beams of solid light are in fact levers. The invading planet, which is named Wandl in case you didn’t figure that out already, shoots a similar one at them with the purpose of stopping the planet’s rotation. Furthermore, it can’t happen all at once, so Wandl shoots its beam for a few minutes each day, slowly reducing the rotational velocity of each planet and giving our heroes enough time to save the day. To what end? Oh, this is the best part. This is the part I both love and hate. It’s a solidly original villain scheme that I’ve never seen elsewhere, but that might be because it’s also so stupid. The people of Wandl (we never get a demonym for these people?) are stealing our planets. Once they’ve stopped their rotations, they’re going to hitch them up and haul them across interstellar space to their home system, to use as worlds for their own people. Now, the book does address the fact that taking the planets away from the sun will kill all life on them. The Wandlites (weren’t those a thing from Animorphs?) are counting on that. They have to exterminate all the life before they can take them over, right? Of course. Seriously, there’s no reason to haul these particular three planets across the stars for this purpose. If you’re going to sterilize them first, just grab some other planets that don’t already have life on them! What’s the deal!?!? There are plenty of them. And what makes it even worse is that the Wandlsons are supposed to be brilliant. They’re stereotypical brain aliens. Sure, they have all this cool technology, so I guess that’s a point in their favor, but what are they doing with it? Why this decision? It makes no sense! Whatever. Here’s the other part that’s great and makes me think that Ray Cummings was having a fine old time writing this stuff. All of the military forces of the triplanet alliance (it’s not called that but what a cool name) are gathered to take on the Wandlsykeses. Gregg is given a ship. His first real command! See, in the previous novel he was the navigator of the Plantetara, which was destroyed near the end of the book. At least I think it was. This book says it was destroyed. That’s all I can honestly say I know. Now he gets his own ship, the Cometara. Gregg meets his new crew, gets situated, thinks about how cool this new ship is, and plunges it into battle, where it is immediately destroyed. Not only that, but Gregg is the single survivor. He is so incompetent and/or unlucky that he wastes the lives of some number of people I don’t remember. Some of them had names, though. I still don’t think that the author meant to set up Gregg as such a useless schlub. What I think is going on here is that the author needs to set the stakes. There’s a thing you’ve probably heard of, “The Worf Effect.” It takes its name from how Star Trek: The Next Generation would have to show us a new hostile creature is a real threat, so the first thing it would do is take down Worf, the strongest member of the crew. It’s how we know that it just got real. I think that’s what’s happening in this book, to some degree. We have to know that the situation is dangerous and the enemy is powerful. The author knows that a protagonist who just wins all the time undermines this, so he went in the extreme opposite direction. How intentional or conscious this is is a matter of debate and may be impossible to know for sure. Also, does this make Gregg a schlemiel or a schlemazl? I’m gonna need you to weigh in. I’d be curious to know if his other books work this way. So after his ship gets blown up, Gregg floats around in space for a minute or two and is then captured by the Martians. He links back up with Snap, Anita, and Venza. He pretends to come over to the other side for a while, just long enough to get to Wandl proper. He learns a lot of things that I’m pretty sure the women already knew (they usually exist in dialogue just to confirm whatever Gregg just said), and figures out a way to stop the planet and also get back home safely. The book was still better than Brigands of the Moon. It had some original ideas and fewer lines of dialogue that denigrated women. Maybe none? I found myself losing focus a lot. Part, but not all, of that was simple tiredness. This book did nothing to alleviate that tiredness. You know how sometimes you read a book late into the night despite being exhausted and you only realize it after you’re done? You’re just so transfixed? Wandl the Invader was the opposite of that. Midday and I’m sitting on the least comfortable chair I own and I still dozed off. One very minor nitpick that I’ve seen happen elsewhere, but only started thinking about it here because it was, you know, anything but the book itself. It might be the pettiest peeve I’ve got! It’s when the narration of the book makes reference to a time in its own future. This might be later in the book, or it might be after the book has ended. Later, when Steve looked back on this moment, he wondered why he hadn’t initiated the emergency Freedok procedures earlier. You know what I’m talking about? It just bothers me. Rips me right out of the narrative. It’s not (just) that the author outright told us the character will survive the book, either. Stephen King is fond of this trick or ones like it. On the other hand, let’s look at that previous paragraph about our favorite outer space ombudsman and zest it up a little, shall we? Later, when Steve looked back on this moment, he wondered why he hadn’t initiated the emergency Freedok procedures earlier. It might have saved his life. In conclusion, I don’t think I want to read any more Ray Cummings books and I hope I don’t accidentally do it again. I recognize that he was an early giant in the genre (one of the few big-names to predate Gernsback, I see here) and that he’s responsible for several things that would later become sci-fi staples, but I just don’t like the way he wrote. Then again, these two books are rather late in the game for him and are probably minor works. A lot of people online are suggesting the 1919 story “The Girl in the Golden Atom,” so maybe that’s worth a try. This particular Ace Double’s other half is John Brunner’s I Speak for Earth, which looks interesting. That’ll probably be the next review. Some guys fall for a pretty face, and I’m with you on this one. If I had seen the alien on the cover, I would have been tempted to read on myself. Thank God now I don’t have to. Thank you reading this so I don’t have to. Much like “Runts of 61 Cygni C”, it’s got an intriguing cover tempting you in, even though you know it’ll never live up to it. Oh, the fake title for this cover that made me laugh the most was “That’s it. I’m deleting Tindr” :-). Also I note that the Martians Moa & Miko make a comeback in this book, despite Moa killing Miko, and then committing suicide over her love for Gregg. Eh, maybe Miko & Moa are common martian names, like John & Marsha..